This recent work from author Austin Kleon aims to address the issue of getting your work discovered in our modern, busy, noisy world. Much like his previous book, Steal Like an Artist (which I also reviewed here), it is an unconventionally written book, with a very brief, casual voice that focuses on some simple, but actionable tips. Kleon delves into things like being authentic, utilizing social media and other platforms to share content (your own and others), as well as just sharing your story and having fun with the process of creating. I don't think any of these tips are revolutionary, but seeing them here as well as other books and articles I've read further reinforces the advice. I do my best to embody many of them already, and it has been effective, so it deepened my commitment to keep it up after reading this book. I will say that Kleon's work is probably not for everyone. I appreciate the candid, casual feel to these books and others like it, but it I have started to think that many will see them as too simplistic and too cavalier. It assumes a lot I think to just lay out the advice these sort of books do (essentially, just do it and the success will come) since I think life is a lot more complicated than the way these sorts of books convey things. They also seem to convey a bit of privilege at times that makes the advice less accessible to most people. From my point of view, not everyone can just drop everything and go for their "passion". People need to be able to pay their bills and live their lives while not having to worry about if their art is going to make them enough money. Thankfully, Kleon does acknowledge this a bit by seeing a lot of people as working a full-time day job to fund and supplement their creative "side hustles", and if you can make money off of this effort, that's great but it isn't necessary. This is refreshing and far more realistic from my point of view. Not everyone is going to have the time or the money to devote to creating a living for writing from nothing, and it is important to acknowledge that with a book like this. I'm glad this one does. 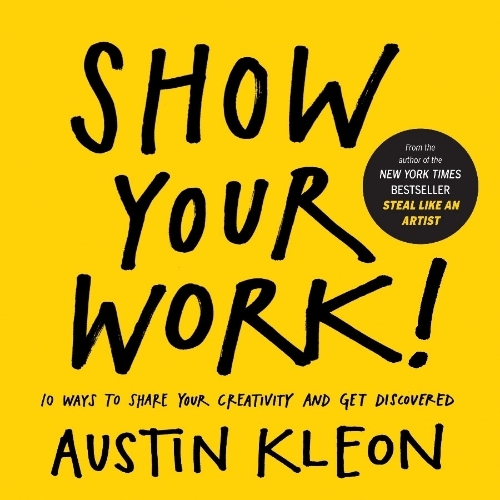 With all that being said (just had to get that out) I think this book, and Kleon's other work, Steal Like an Artist, are great starters for someone looking to nourish a creative hobby and looking to get it noticed too. I know I write for myself, but I'd also love for my writing to help and positively impact other people. I write from the heart and it's awesome to connect with other people through it. Check out Show Your Work! and purchase it at any of your favorite book retailers.